MBS Student Association convened a panel of experts to discuss the future of work in an increasingly digital world. In 2013, researchers at Oxford University conducted research on the future of work. They concluded that almost one in every two jobs have a high risk of being automated by machines. 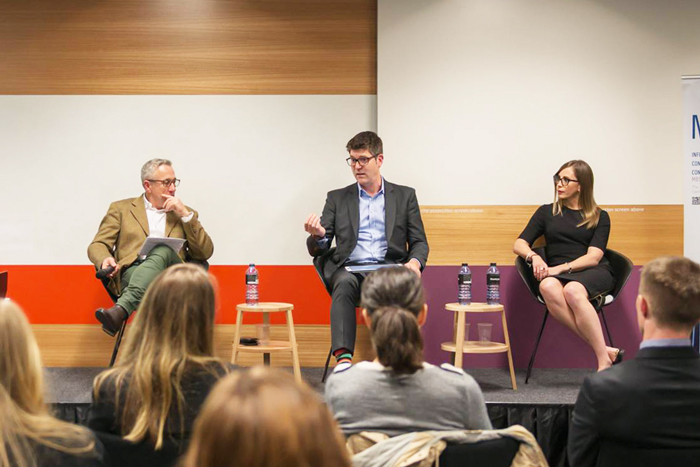 In view of current Melbourne Business School (MBS) students about to enter the workforce, the MBS Student Association (MBSSA) held a panel to discuss the future prospects of work, and how likely digital disruption is to affect soon-to-be graduates. The Let’s Talk – digital disruption of future work panelists included Professor Peter Gahan, the founding Director of the Centre for Workplace Leadership and Professor at the University of Melbourne, Richard White, an Account Manager for Cisco Systems Australia, and Phoebe Nugent, General Manager of Enterprise Mobility Business and Market Development at Telstra. The event was moderated by MBS student and MBSSA committee member, Sandorica Bhandhumani. Panelists (L-R): Professor Peter Gahan, Richard White and Phobe Nugent. “Mundane and repetitive tasks that are susceptible to human error are likely to be replaced by automation," said White. Gahan further explained that the impact of automation and machine learning is not only limited to low-skill jobs – it also impacts high-skill jobs and is already reshaping professions such as law, accounting and architecture. Companies like Telstra and Cisco have been trying to embrace the change and, more importantly, figure out how to help customers take the lead. One such way is by adopting activity-based working, in which employees no longer have set desks, and make use of shared desk spaces instead. Nugent commented on Telstra’s transition to activity-based working, noting that “the office is a place you do work, not your second home." "Overall however, this [change to activity-based working] improved employee engagement," she said. "It has saved a lot of costs on property rationalisation.” Moreover, all three panellists agreed that by 2020, 60 per cent of companies will have moved towards more of such 'future' ways of working. When the most important question of the evening was asked – will technology and digital disruption cause significant job losses in the near-to-medium future? – Gahan and White had opposing views. However, both acknowledged that the future is unclear and there isn’t enough data available to make a prediction right now. White, on the other hand, believes that “there will be a short term loss of jobs when robots hit the point at which they are replicable at an affordable price." He further added, "This short-term job loss will be similar to the Great Depression, and then we will eventually recover”. The panel concluded by conceding that the future of work still remains unclear. However, they are confident that as more data becomes available the picture will become clearer. Melbourne Business School Students are provided with learning and enrichment opportunities outside the classroom. Many of these are run by student clubs and societies, in conjunction with the Faculty's Student Employability and Enrichment Team. Learn more about student clubs and societies.